Trump says that while he still reckons he could win a full election, he is “not ready to leave the private sector” to run. DONALD TRUMP has announced that he will not be running for the Presidency of the United States in next year’s election. Billionaire Trump, who had been expected to put himself forward for the Republican Party – or to potentially put himself forward as an independent candidate – this evening said his decision was due to his desire to remain involved in the business sector. I have spent the past several months unofficially campaigning and recognise that running for public office cannot be done half-heartedly. Ultimately, however, business is my greatest passion and I am not ready to leave the private sector. Trump was one of the main parties behind the campaign to have current president Barack Obama release his birth certificate, which he did last month. Many had expected that the ‘defeat’ on that issue would see Trump’s prospects knocked, while others had pointed to Trump’s notorious secrecy about the nature of some of his financial dealings – which he would have had to give up, through electoral funding declarations, if he opted to run. Trump had performed strongly in opinion polls to date, trailing only Mitt Romney in a recent ABC News poll. Another Gallup poll had recently put him tied for the lead in the Republican stakes with former Arkansas governor Mike Huckabee, who formally announced at the weekend that he would not be entering the race either. 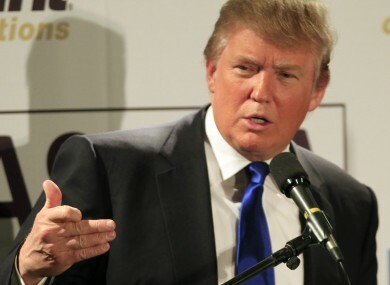 Email “Donald Trump rules out bid for US presidency in 2012”. Feedback on “Donald Trump rules out bid for US presidency in 2012”.